Charlotte Lewis, as Kee Nang in the hit 1986 film "The Golden Child" opposite Eddie Murphy, is a certified action starlet! Kee is a terrific character on many levels. She has that exotic Asian beauty (her character is Tibetan), tall and statuesque, and can definitely muscle around the bad guys! She kicks, punches, tosses punks around, and even does, as Eddie's character in the movie says, "that thing...with the flip!". I like it that she doesn't fall all over the male lead right away like a lot of film heroines do. She eases up eventually, but at first is not all that impressed with Eddie. Kee Nang has that dry wit which is actually pretty funny. In addition, she can take care of herself and Eddie just fine. She only has to get saved once when she sacrifices herself in front of a crossbow dart to save Eddie. Kee Nang dies, but is brought back to life by Eddie near the end of the film after the villain is killed. Happy ending! Then she and Eddie are an item after they've saved the world...which is a good thing! Incidentally, Charlotte Lewis is from England, but her ethnic background is Irish and Arabian. 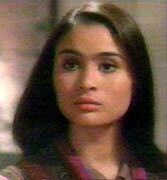 Charlotte Lewis as "Kee Nang"